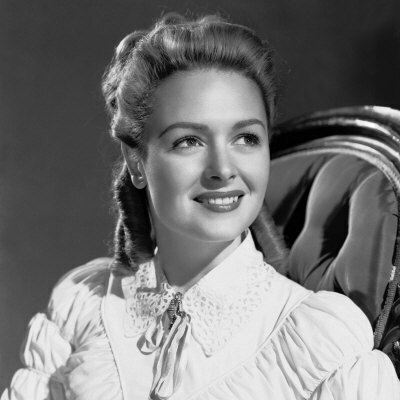 MGM wanted June Allison to play Marguerite opposite Lana Turner. She turned the role down because she didn’t think anybody would believe that William could prefer her to Lana. MGM then essentially drafted Donna Reed into the role, whose misgivings were also strong (but she had no clout at the studio). On the island of St. Pierre in 1847, young adult sisters Marianne (Turner) and Marguerite (Reed) lead happy, comfortable lives as the daughters of shipping magnate Octavius Patourel (Edmund Gwenn, who played Kris Kringle in Miracle on 34th Street) and his wife Sophie (Gladys Cooper). Marianne has a sharp mind and knows a lot about her father’s work, which he thinks is not quite ladylike. Marguerite is more reserved and dreamy. From afar, Marianne is loved by a young local man, Tim Haslam (Van Heflin), much to the dismay of his girlfriend. When new neighbors move in next door, the sisters rush over to welcome the family: Dr. Edmund Ozanne (Frank Morgan, who played the wizard in The Wizard of Oz) and his handsome son William (Roger Hart). At first, William is not that impressed with the girls, but thinks they’re very pretty. But in no time, the three become good friends. One day, Marianne insists on taking William out to see a large shipping vessel, The Green Dolphin. It’s under the command of a gruff, yet kind-hearted Irishman, Captain O’Hara (Reginald Owen, who played Scrooge in A Christmas Carol). He proudly shows the young people around his ship, and tells them a bit about his adventures. He’s been as far away as New Zealand! Both Marianne and William are fascinated by the thought of such a life. Since William wants to be a sailor, Marianne convinces her father to provide the funds. (Being a man, he can do the things she’s always dreamed of doing.) William goes off to London for 2 years. Their families don’t realize that William and Marguerite have fallen in love; they decide to keep it a secret. They do, however, write letters to each other. I’m not going to reveal too much, because I want you all to check it out! I recommend this movie to anyone who enjoys large-scale, old-fashioned epics (such as Gone with the Wind). However, because of its few main leads and focused theme (first love vs. love that grows over time), it seems like a small picture. There is fine acting, sharp dialogue, and lots of character development. I especially liked Heflin’s anti-hero character.